Here are some of our favorite scary drawings of a deadly fate that awaits someone, made by artistically precognitive children. In The Ring, Aidan draws pictures of his dead cousin buried...before she dies. He also later draws the ring a bunch of times as well as pictures of Samara. In the process, he freaks out his mother, Rachel... and the audience. This was then parodied in Scary Movie 3 with the drawings of Cody. This acutely clever work of parody, like the rest of the Scary Movie series, is pure genius. Cassie Holmes, as played by Dakota Fanning, has the supernatural ability to predict the future in the movie Push. Here, she is showing her prediction to her companion Nick. Unfortunately for them, it depicts their deaths in their fight against the evil Division. Still, bonus points to Cassie for using a non-crayon medium. At the beginning of the seminal horror movie Children of the Corn, young Job narrates how the children killed the adults and took over Gatlin, Nebraska. During this, he also mentions his sister Sarah being at home with a fever at the time of the rampage. While in bed, Sarah started drawing pictures of the violence as it was happening far away from her, including this one of the bloodbath at the coffee shop. The 2008 Finnish horror classic Dark Floors features a group of six trying to survive a suddenly abandoned and monster-inhabited hospital. Their hopes rely primarily on the child Sarah, who has a creepy habit of drawing encounters with various horrors before the group actually experiences them. This first happens with this beautiful drawing of a dead, eyeless woman. Incidentally, the movie's budget of almost five million American dollars makes it one of the most expensive Finnish movies ever. Easily the least creepy drawing from this gallery comes from The Adventures of Shark Boy and Lava Girl. Max, the main character, has a dream journal and within it draws Shark Boy, Lava Girl, and their world. Soon enough, the two worlds intertwine and Max adventures with the pair. In Lost, a young John Locke gets visited by Richard Alpert. During that visit, Alpert noticed a drawing that Locke had done, which looks ominously like the Smoke Monster that would later be found on the island. In the international classic Godzilla v. Biollante, a group of psychic school children all draw pictures of Godzilla returning from his volcano prison. They get their point across in an unbelievably creepy way. In The Butterfly Effect, Ashton Kutcher's character, Evan, can time travel through different points in his time-line. For one, he is able to travel back to when he was a kid and have himself draw this disturbing picture. In the movie Silent Hill, little Sharon defaces her earlier, cute pictures into creepy pictures of Silent Hill. Even creepier, she doesn't remember changing them. Creepiest of all? The movie nearly made 100 million at the box office. 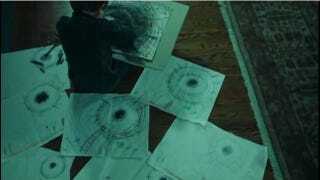 In the movie Hide and Seek with Robert De Niro, the character of Emily is seen drawing this picture. When asked by a police office what it was, she explained that it was his death. He, of course, later dies. The child Dalton, from the movie Insidious, draws this picture of the red-faced demon from his dreams that eventually takes his soul. Although not a child, the character of Isaac Mendez from the show Heroes could predict the future, and did so through his artwork. Eventually he predicts his death at the hands of Sylar, as showcased by his painting. Again not a child, Alice Cullen from the Twilight series can not only see, but draw the future as shown in this beautiful example. And although this is by no means a drawing, this subtle moment from Final Destination 2 before the opening highway wreckage is too bizarre not to include.